My latest piece represents a dream sequence, which suggests that I dream in violet and gold. 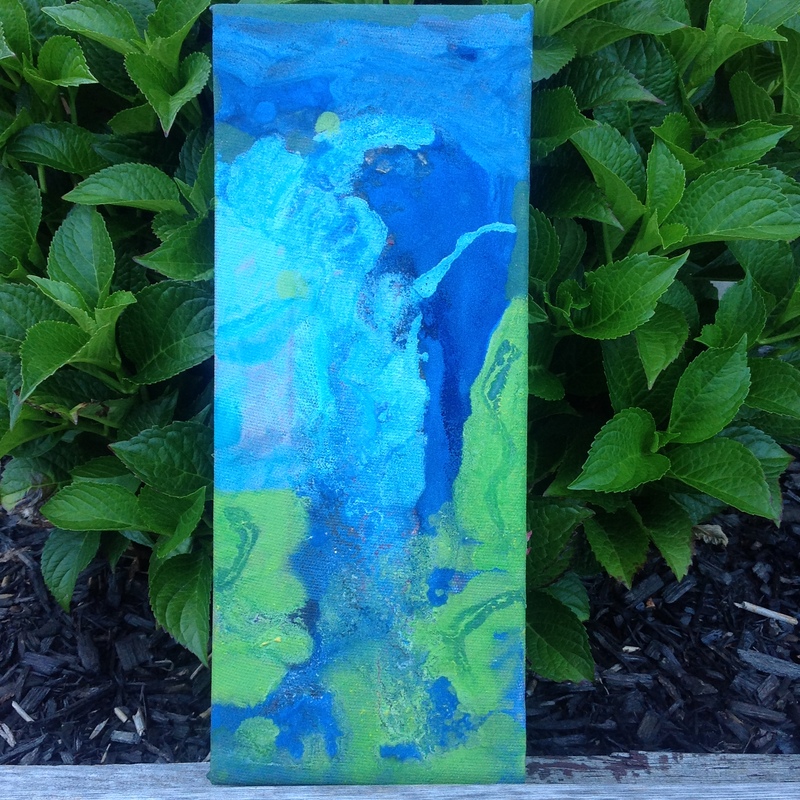 This 6 x 12 acrylic on canvas piece definitely captures the uncertainty and mixed expectations often found in dreams. I especially like the marbling effects that are present in the areas where violet/blue meets lighter peach colours. This is the second of my pieces that I have has the pleasant opportunity to photograph in my backyard among my plush hydrangea plants. Looking at the beautiful shape of the leaves, they add a nice contrast against the colour variety found in this piece, entitled No. 20. I have returned to colours like aqua and green in my latest work, called No. 19. It is summer here in Southern Ontario, which means that my backyard is the perfect location to take full-light photos of my work. The backyard gets full sun for 6+ hours per day (which can make it very very hot during our 30 + degree Celsius weather). The hydrangea plants serve as a perfect backdrop for smaller pieces. The rich green in the leaves make for an engaging background with lots of depth. A short video I did a little while ago in my backyard. The music was also created by me (another fleeting side hobby), and it highlights how I paint my art canvas when I “DIY”my medium. My latest piece entitled: “The Dark Spot” looks a lot like a rorschach test. It can be hung in any orientation, but I chose to upload it in landscape to that it would be easier to view. I used cerulean blue and slate grey to create contrasting fields that slowly deepen into the dark violet area. This dark spot reminded me of an inky blot. It holds mystery and intrigue. It is definitely one of my recent favourites. My latest piece, No. 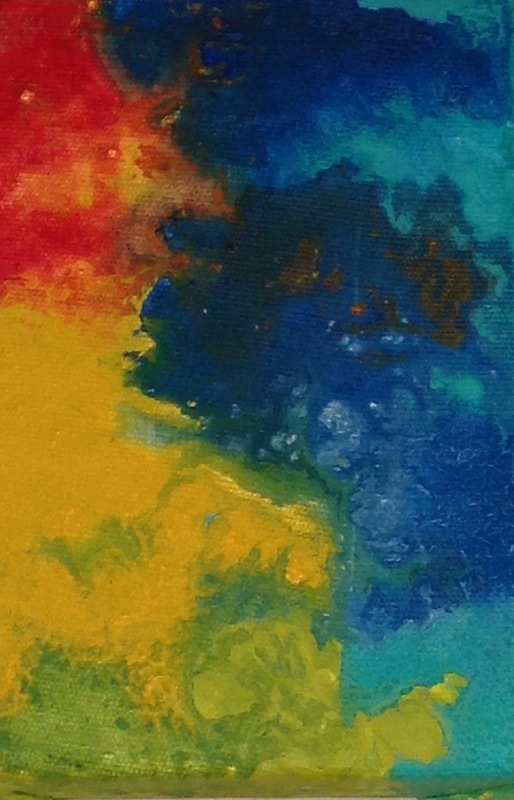 18, is a colourful menage of blue, yellow, and orange/red. In this pieces I wanted something that could be hung in any orientation that was pleasing to the eyes. It’s nice to be flexible with design and art. I think that flexibility allows for more enjoyment in life.